The extremely dry conditions of last year’s growing season will likely impact the 2017 berry crop. Many beds did not develop optimal plant populations because runner growth was poor, and runner rooting was delayed and weakened by the dry conditions. As a result, many beds look thinner than we would like and may have a somewhat smaller crop. On the brighter side, we are now out of the drought conditions, and there is good potential for thin plantings to recover with good runner production after harvest. A winter that features wildly fluctuating temperatures is typically very hard on berry plants, but this past winter never saw extreme cold, and winter injury has only shown up in few plantings this spring. It has been most prevalent in older beds grown in heavier soils, and where straw mulch was not used for covering the plants. Winter injury can be diagnosed by cutting into the crowns of the strawberry plants. The internal tissue will show dark brown discoloration. To reduce the impact of winter injury, make sure the plants get plenty of water, and apply nutrients to encourage root growth and flower development, including nitrogen, calcium, and phosphorus. Heavy nitrogen fertilizer applications in the spring are not recommended, but up to 20 pounds of actual N (e.g. 125 lb. calcium nitrate) may improve early spring growth. 2017-2018 New England Small Fruit Management Guides are at the printers and will soon be available from UMaine Cooperative Extension. The guide contains the latest information on management options for small fruit pests as well as cultural information. We’ll make them available as soon as they arrive. While you’re waiting, the revised edition is already available on the UMass Extension website. We will begin scouting strawberry fields for major insect pests next week, including volunteer farms in Wells, Limington, Cape Elizabeth, Minot, New Gloucester, Dresden, Monmouth, Wayne, and Farmington, and will be reporting our findings through this newsletter and blog on a weekly basis until harvest time. You can also get quick access to this information on the UMaine Pest Management web page. 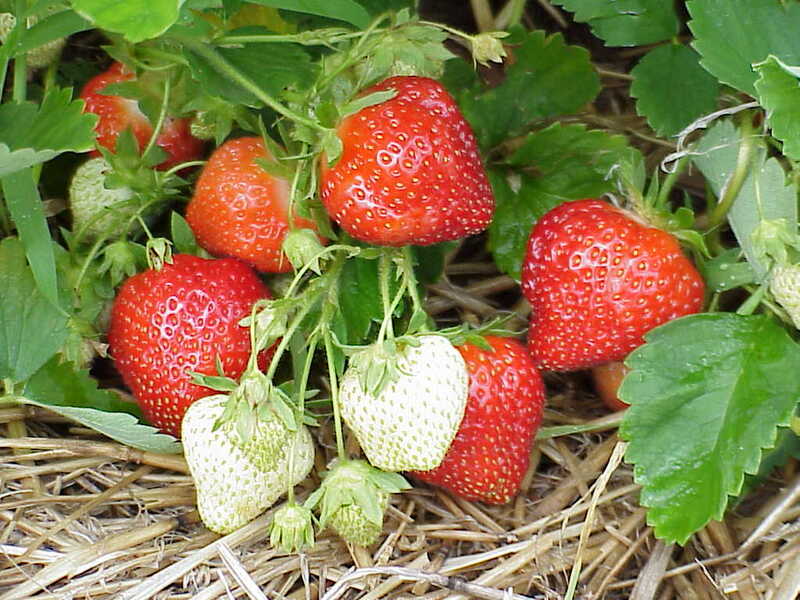 The best way to manage strawberry pests is to scout your own fields regularly and often. You should start scouting regularly as soon as flower buds emerge from the crown. You should be able to identify the major pests and their damage, and be able to determine if control measures are necessary. 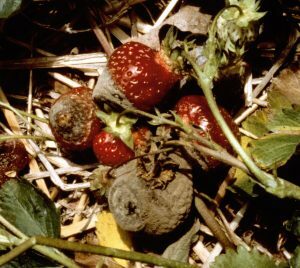 To properly scout your fields, you may want a copy of the Strawberry Production Guide for the Northeast, Midwest and Eastern Canada. This contains detailed information on strawberry pest identification and monitoring, and also provides information on all other aspects of strawberry production. It may be purchased for $45.00 per copy from the University of Maine Cooperative Extension Publications Catalog online. Strawberry bud weevil or “clipper” are becoming active as flower buds begin to emerge. Clipper activity has been observed in southern Maine this week. The clipper is a small weevil, which girdles strawberry flower buds, causing them to dry up and fall off the flower stalk. Scout for damage by counting the number of clipped buds in two feet of row length at five different locations in a field. If the average number of clipped buds per two-foot sample exceeds 1.2, or if live clippers are found, control measures are recommended. Damage is usually first noticed at the edges of the field. Border sprays may be effective in keeping this insect from becoming a problem in larger fields. Fields with a history of clipper problems will typically exceed threshold nearly every year. Insecticide options for clipper include Lorsban®, Brigade®, Sevin® and PyGanic®. Tarnished plant bugs adults will soon be laying eggs. Strawberries are one of their preferred hosts at this time of year. Once the eggs start to hatch, we’ll find the nymphs feeding in the flowers. The nymphs are small, active, yellow-green insects. It is important to scout for them regularly, as they can appear very quickly in warm weather. 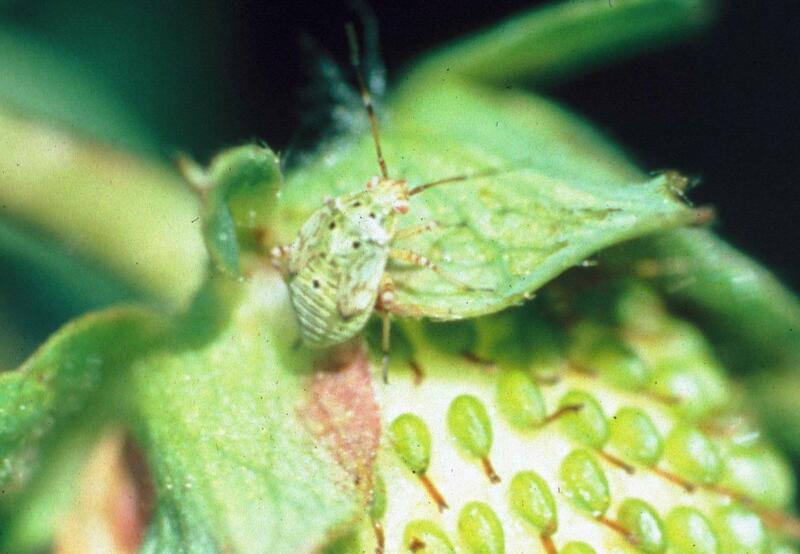 Tarnished plant bugs feed on the open strawberry flowers, causing the berries to have seedy ends. To scout for the nymphs, shake 30 flower clusters (six clusters in five different locations) over a plate. If four or more of the clusters out of the 30 sampled have any nymphs, control measures should be taken. Be on the alert and scout your fields as soon as open flowers appear! Insecticide options for tarnished plant bug include Assail®, Brigade®, Danitol®, Dibrom®, and PyGanic®. Cyclamen mites: Plants showing weak growth and yellow, pinkish or blackened, crinkled leaves may be infested with cyclamen mite. Cyclamen mites are very small, smaller than spider mites, and reside in the crown of the strawberry plant feeding on the developing leaves and flower buds. They are very hard to see, even with magnification. Infested plants have shrunken distorted leaves and flower stalks, and produce few, if any, marketable fruit. The miticide Portal® can be effective, but must be applied in lots of water and a spreader adjuvant to be sure that the material is carried down into the crowns where these mites reside. Two-spotted spider mites can be a problem in the spring, especially for plants under row covers. This is often where we first find mites. The cool wet weather of recent weeks has kept spider mite populations low (we haven’t seen any yet), but they will reproduce rapidly when warm weather arrives, so it is important to scout for them regularly. Spider mites mostly feed on the undersides of strawberry leaves, rasping the plant tissue and sucking the sap. 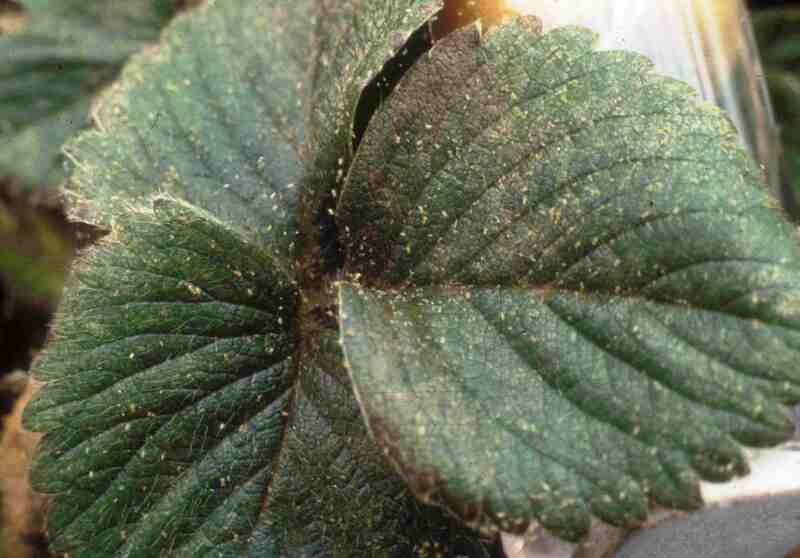 Infested leaves will develop yellow flecking and a bronzed appearance. The plants become weakened and stunted. Fields that have had excessive nitrogen fertilizer and/or row covers tend to be most susceptible to mite injury. To scout for mites, collect 60 leaves from various locations in the field and examine the undersides for the presence of mites. Mites are very small – you may need a hand lens to see them. Chemical control options for two-spotted spider mites include Acramite®, Portal®, Nealta® Savey®, Zeal®, Vendex®, Oberon®, Brigade®, Danitol® and JMS Stylet Oil® (oils will cause plant injury if used in combination with captan or within 14 days of an application of sulfur). Fields that were infested with root weevils last summer should be inspected for grubs this spring. Infested plants appear week and stunted, usually in somewhat circular patches in a field. Digging under the plants will reveal small (1/4”-1/2”) crescent-shaped legless grubs. Typically, the grubs begin to pupate when the plants are in bloom. A soil drench of Platinum® (thiamethoxam) insecticide during the spring and/or fall when the grubs are active in the soil can provide control. However, Platinum® has a 50 day pre-harvest interval, so it is too late for applications in most fruiting fields this year. Platinum® may also be used as a pre-plant or planting treatment for root weevils. It is not too late to put on an application of nematodes to control the grubs (optimal timing is about mid-May). 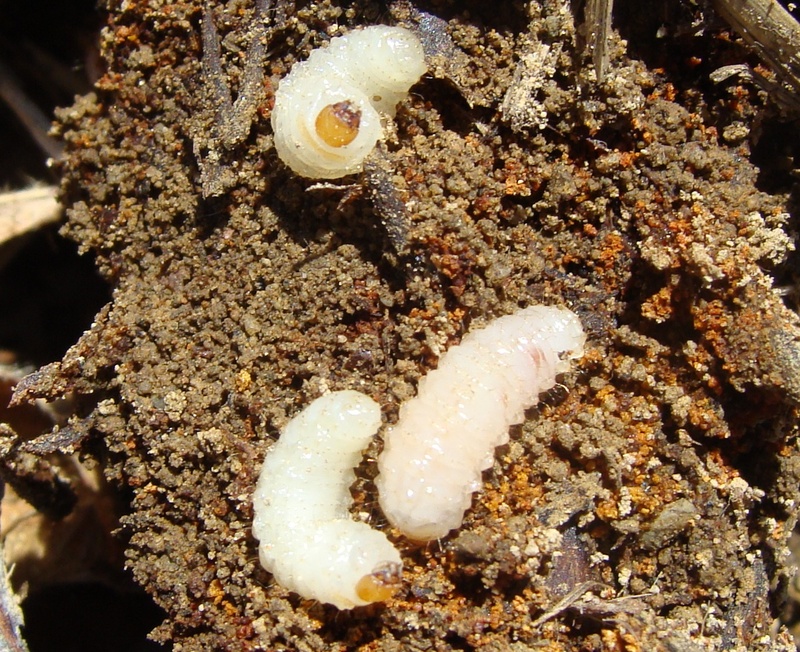 Two species of nematodes appear to offer the best control of root weevil grubs. Heterorhabditis bacteriophora (Hb) appears to be the best candidate for control of root weevils when the soil temperature is above 60 degrees, and is available from Green Methods; the Integrated Biocontrol Network; and Koppert Biological Systems. Powdery mildew: This fungus disease may first show up as purple or red blotches on the leaf petioles and flower stems in strawberry fields. Most of us are more familiar with the later symptoms of upward curling of the leaves and white, powdery growth on the undersides of the leaves. Some small infections of powdery mildew were observed in southern Maine this week. 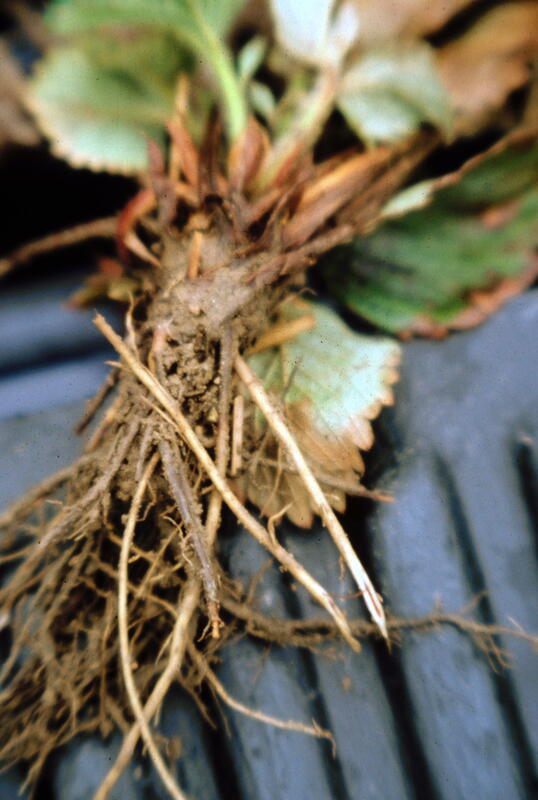 Check your fields for pinkish purple leaf and flower stem lesions as new leaves emerge. Pristine®, Cabrio®, Topsin-M®, captan, Procure®, Torino® and JMS Stylet Oil® are presently registered to control powdery mildew. Twilight Meeting Tuesday June 13, Lavigne’s Strawberry Farm, 158 Whichers Mill Road, Sanford, ME 04073. Brothers Albert and Patrick Lavigne will be showcasing their farm, which features large strawberry and high bush blueberry plantings grown on very sandy soil. They have pursued extensive pond construction and irrigation development at the site and have adapted farm equipment to better suit their crops and growing practices. We’ll have a tour of the berry fields and pond construction, and discuss the challenges of water and nutrient management in these very light soils. We will also get an update on the berry pest situation around the state, and have an opportunity to look over the equipment they use and have adapted for their operation. The meeting will run from 5:30 p.m. to 7:30 p.m. More details to follow. Hope to see you in Sanford!